Did you know that boxers and pit bulls are commonly mistaken for one another? They're both lovable mid-sized dogs with short, shiny coats and ears that can be cropped to stand up and hang down, but aren't exactly the same. While boxers are a breed recognized by the American Kennel Club, a pit bull actually isn't a breed, but a term used to describe three different breeds and mixes between them: the American Pit Bull Terrier, the Bull Terrier, the American Staffordshire Terrier, and the Staffordshire Bull Terrier. While they may look similar in build, boxers and pitbulls can be quite different in temperament, longevity and health needs. If you're looking for a furry four-legged friend, knowing what exact breed of dog you have can help you be the best caretaker you can be. Both boxers and pit bulls are quite muscular, but there are differences within their shapes. Boxers are a bit sleeker and pit bulls are more stocky, and boxers' tails are docked while pit bulls have long, sleek tails. Both boxers and pit bulls can either have their ears cropped, which raises them, or they may be left natural and floppy. Expect any boxer or pit bull to be very friendly. They love people and aim to please. Boxers have lots of energy and are happy dogs that want lots of play, especially with children. 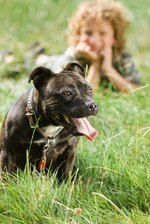 Pit bulls have the undeserved reputation of being aggressive dogs but this is true only when they are raised to be aggressive towards other animals. They are rarely aggressive towards people. Pit bulls and boxers both are great family dogs. If you have either of these dogs you should be prepared to give them plenty of exercise — they have so much energy! Most boxers also make good guard dogs as they are smart, agile and protective of their families. Pit bulls, on the other hand, are so loving that they might ask a burglar to pet them instead of protecting the home, so maybe get an alarm system if you have one of these sweet pups. Boxers and pit bulls are similar in size; boxers tend to be about 22 to 25 inches tall and pit bulls run a little smaller at 18 to 22 inches. Boxers commonly weigh between 55 to 70 pounds, but pit bulls will have a much larger range, from a light 25 pounds up to 110 pounds. Boxers can live from 11 to 14 years. Pit bulls usually live about 12 years. Make sure you take your boxer (or pit bull!) to the vet for regular checkups! Take your prospective pup to a veterinarian before making a final decision. It is good to know what you will be getting into before making a commitment. Boxers can fall prey to a number of ailments, including heart and thyroid difficulties, cancer, hip dysplasia, arthritis and, in white boxers, deafness. They also drool and can have extreme flatulence, depending on what they eat. Pit bulls are a healthy breed but they can get hip dysplasia, allergies to grass, cataracts and heart disease. Take your boxer or pit bull out for walks, runs and play often. Boxers and pit bulls are energetic breeds. They can live in closed quarters, such as apartments, but expect both to need much exercise and play. The pit bull will need even more activity than a boxer, though both will require a significant amount. Neither of them like cold weather, perhaps due to their short coats. A fenced yard, lots of walks and a doggy-jacket for colder weather are important for both breeds. Unfortunately boxers and pit bulls and other so-called "bully breeds" have a reputation for being aggressive and dangerous, and some people have misused and abused the breed in the past, changing how we see them. With love and care both these breeds can be wonderfully rewarding pets, but in certain neighborhoods there are trends to legislatively remove pit bulls from communities, called Breed Specific Legislation. If BLS is happening in your community, contact the Humane Society of the United States for information on how you can help.